Oxley: The roads to, and parking at this site are very good and are 2WD in any conditions. There is no boat access. The bank slope is moderate to steep, and the bank access to the water is hard to moderate. Picnic tables are the only facilities available. 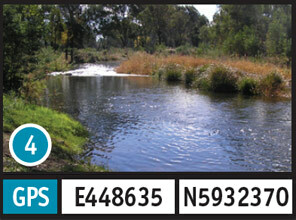 The turn off to this site is located 11.6km south of Wangaratta along the Wangaratta-Whitfield Road. 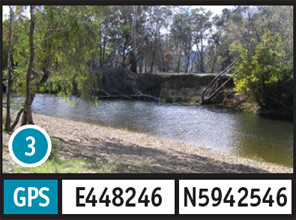 The access point (or parking) is a further 1.7km east along Glenrowan-Myrtleford Road, then south along King Street. The target species are Murray cod and trout. 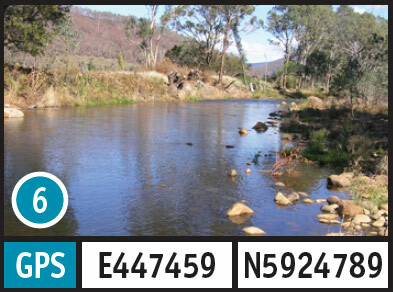 Moyhu: The road to this site is accessible in a 2WD vehicle in any weather conditions, however access and parking at this site should only be attempted in a 2WD vehicle in the dry. The bank slope is flat to moderate and the bank access to the water is good. There are no facilities available. The turn off to this site is located 27.9km south of Wangaratta along the Wangaratta-Whitfield Road. The access point (or parking) is a further 1.3km east along the Moyhu/Meadow Ck Rd. The target species are Murray cod and trout. Edi Cutting Camping Grounds: The road to this site is accessible in a 2WD vehicle in any weather conditions. Access to the site and parking for a 2WD is dry weather only. The bank slope is moderate and the bank access to the water is good to moderate. Camping is permitted and toilets and a fireplace are available here. The turn offs to these sites are at 36.7km and 37.9km south of Wangaratta along the Wangaratta/Whitfield Rd. The target species is trout. Gentle Annie: The road to, and parking at this site is good and can be accessed in a 2WD vehicle in any weather conditions. Slope and the bank access to the water are moderate. Camping available but has to be organised with the caravan park, next to this site. There are also fireplaces. The turn off to this site is located 48.7km south of Wangaratta along the Wangaratta/Whitfield Rd. The access point (or parking) is a further 800m East along Gentle Annie Lane. The target species is trout. Cheshunt Bridge: The road to, and the parking at this site is good and can be accessed in a 2WD vehicle in any weather conditions. The bank slope is steep and the bank access to the water is moderate to hard with access also available on the opposite bank. There is a picnic table available here. 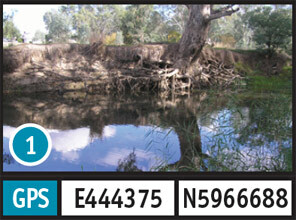 The turn off to this site is located 51km south of Wangaratta along the Wangaratta-Whitfield Rd. The access point (or parking) is a further 3.2km south of Whitfield along the King Valley Road. The target species is trout. 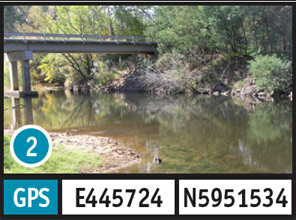 Hamiltons Bridge: The road to this site is accessible in a 2WD vehicle in any weather conditions. Access and the parking at this site should only be attempted in a 2WD vehicle in the dry. The bank slope is flat and the bank access to the water is moderate, but there are no facilities available. 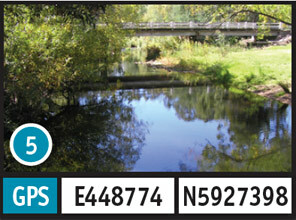 The turn off to this site is located 51km south of Wangaratta along the Wangaratta-Whitfield Road. 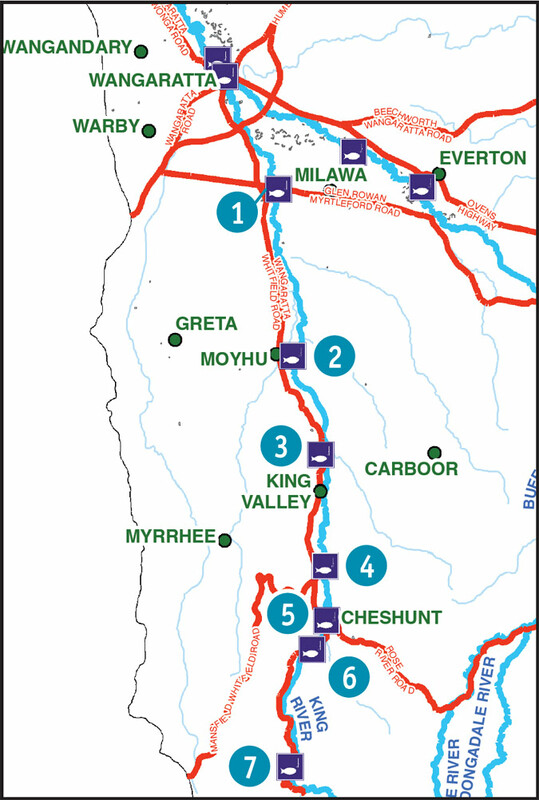 Take the King Valley Road for 5km then the Upper King River Road for a further 4km. The access point (or parking) is 50m from GPS E447459 N5924789 that turn off. The target species is trout. 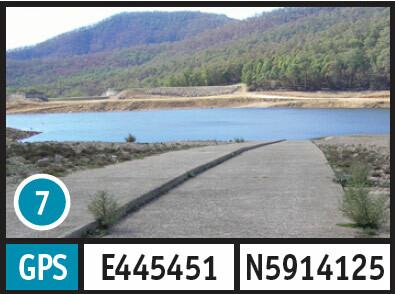 Lake William Hovell: The road to, and the parking at this site is good and is accessible in a 2WD vehicle in any conditions. The concrete boat ramp is 2WD in any weather although dependent on water level. The bank slope and bank access to the water are moderate. There are toilets, picnic tables and fireplaces. The turn off to this site is located 51km south of Wangaratta along the Wangaratta-Whitfield Road. Take the King Valley Road for 5km then the Upper King River Road for a further 14km. The target species is trout.